Your child’s pathway to enter into and access the NDIS will depend on a number of factors. The first step to accessing the NDIS is meeting the eligibility criteria. the holder of a Protected Special Category Visa. doesn’t currently receive disability supports but used to. My child is 0 – 6 years old, how can they access the NDIS? What is the ECEI approach? Who will work with my family so we can access the NDIS when my child is 0-6 years old? To deliver the ECEI approach, the NDIS has partnered with early childhood organisations, known as an Early Childhood Partner. The Early Childhood Partner is the point of contact for parents who feel their child has developmental delay or disability. Depending on your child’s needs the Early Childhood Partner may refer your child to mainstream and community services, and monitor your child’s progress. the Early Childhood Partner will develop your child’s plan. My child is 7-18 years old with diagnosed disability, what will their NDIS pathway be? If your child is 7-18 years of age with a diagnosed disability, then they will progress through to the NDIS access and eligibility process. They will have a NDIS planning meeting with the NDIS Planner or a Local Area Coordinator (LAC). Then they will receive a NDIS plan. My child has developmental delay, how do they access the NDIS? results in the need for a combination and sequence of special interdisciplinary or generic care, treatment or other services that are of extended duration and are individually planned and coordinated. Your child’s doctor, paediatrician, maternal health care nurse or allied health clinician can do assessments and provide evidence that your child has developmental delay. Yooralla has a team of specialists who can also assist you and your child with assessments. My child has diagnosed disability, how do they access the NDIS? If your child has a disability that is listed on the NDIS website then there is no need to meet early intervention criteria as your child has a confirmed disability and is likely to be eligible for the NDIS. My child already receives disability support, so what do I do now? If your child has a diagnosed disability or developmental delay, and is currently receiving funded disability support, then your child should automatically transition to the NDIS and you do not need to contact the NDIS. They will contact you. However, if you are unsure about whether this applies to your child, you can contact the NDIS up to six months before it is available in your local area. If your child is under seven years old and is receiving Better Start and HCWA funding, and no other funding such as ECIS, contact the NDIS or Early Childhood Partner at the time of NDIS roll out in your area to confirm if your child will automatically transition. Read more about how to prepare for your child’s planning meeting in Yooralla’s free guide to the NDIS for your child. My child is not currently accessing support for their developmental delay or disability, what should I do? If you do not currently access disability services, but you believe your child meets the eligibility criteria, then your point of contact, after the rollout date of the NDIS in your local area, is the Early Childhood Partner in your community. If your child is older (well into primary school or in secondary school), the NDIS will provide you with an Access Request Form that you will need to fill in. 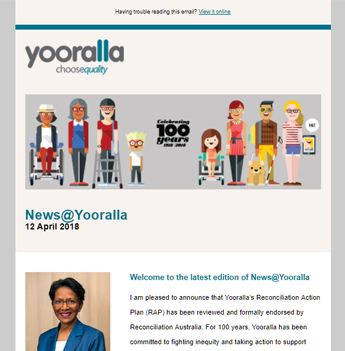 Yooralla has developed a booklet to assist with that process, a guide to Accessing the National Disability Insurance Scheme. My child used to receive funded support but they don’t now, what should I do? It is likely your child will not be known to the NDIS and will not be in the group of children who will automatically transition to the NDIS. In this case, we recommend that you contact the NDIS or the Early Childhood Partner in your area to discuss the best options to support your child. Find out when when the NDIS is rolling out across Victoria.